Checkmate holds the line. Cross it — and theyll take you off the board. Permanently.<br />In this thrilling new ongoing series, the team behind the blockbuster OMAC PROJECT — writer Greg Rucka and artist Jesus Saiz — returns with a different spy agency for a different world. Infinite Crisis has changed the DCU, and Checkmate has shaped its hard-learned lessons into a new game plan.<br />In Checkmate, its all about the balance of power. Between Black and White; between human and metahuman; and between the familiar faces who have become its new Kings and Queens. 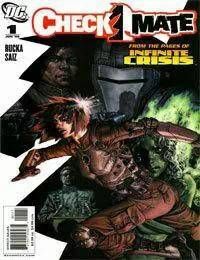 Its also about the propaganda wars, black ops combat, and political manuevering that fuel Checkmates critical missions — missions that take a grueling toll on the agents day-to-day lives.<br />First, however, they must prove their right to exist — to the U.N. And they only have hours to do it in this breathtaking first issue!